Interstate 73 is a freeway first planned in 1991 as part of High Priority Corridor 5 as defined by the Intermodal Surface Transportation Efficiency Act of 1991 (ISTEA). Amendments to the routing of I-73 occurred in 1995 with the passage of the National Highway System Designation Act and in 1998 with the passage of the Transportation Efficiency Act for the 21st Century (TEA-21). In addition to providing for I-73, High Priority Corridor 5 includes the extension of already-existing Interstate 74 from its current eastern terminus in Cincinnati, Ohio, east to Myrtle Beach, South Carolina. Presently Interstate 73 runs in tandem with Interstate 74 and U.S. 220 from Ellerbe northward to Randleman, and then without I-74 from there to the Greensboro Beltway (Painter Boulevard). U.S. 220 extends north as a freeway to Interstate 40 in Greensboro, while I-73 turns northwest along side U.S. 421 to meet I-40 near Central North Carolina International Airport (PTI). U.S. 421 departs for I-40 west while I-73 combines with Interstate 840 northward to Joseph M. Bryan Boulevard. Overtaking Bryan Boulevard around the north side of PTI Airport, I-73 turns west to North Carolina 68. The remainder angles northeast six miles to end at U.S. 220 just south of the Haw River. Interstate 73 in its entirety is part of High Priority Corridor 5: I-73/74 North-South Corridor. Its designation is written into law. Interstate 73 is merged with U.S. 220 for its existing section. It would follow sections of U.S. 52, U.S. 23, and U.S. 127 if extended north to Michigan and sections of U.S. 501 if extended south to Myrtle Beach. Establish Interstate 73 – “Beginning at the intersection of U.S. Route 220 at the Virginia State Line, then southerly over U.S. Route 220 to the intersection of State Route 68 northwest of Greensboro, then southerly over U.S. Route 68 (sic) to the intersection of Interstate Route 40 in Kernersville, then southeasterly over I-40 to the intersection of U.S. Route 220 in Greensboro, then southerly over U.S. Route 220 to the intersection of U.S. Route 1 in Rockingham, then southwesterly over U.S. Route 1 to the South Carolina State Line.” The action to establish this route was continued at the April 1996 meeting, and it was subsequently amended in future iterations by North Carolina and adjacent states. Establish Interstate 74 – “Beginning at the intersection of Interstate Route 77 at the Virginia State Line, then southerly over I-77 to the intersection of U.S. 52 south of Mount Airy, then southeasterly over U.S. Route 52 to the intersection of U.S. Route 311 in Winston-Salem, then easterly and southeasterly over U.S. Route 311 to the intersection with U.S. Route 220 in Randleman, then southerly over U.S. Route 220 to the intersection of U.S. Route 74 in Rockingham then southeasterly over U.S. Route 74 to the intersection of U.S. Route 76 in Whitehall, then westerly over U.S. Route 76 to the South Carolina State Line.” The action to establish this route was continued at the April 1996 meeting, and it was subsequently amended in future iterations by North Carolina and adjacent states. 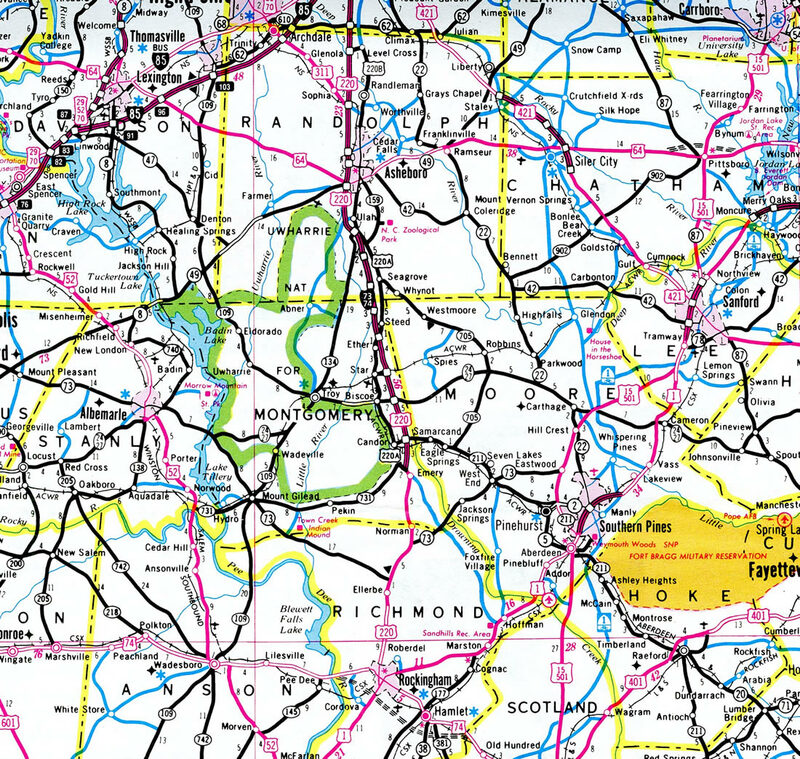 Establish Interstate 73 – “Beginning at the intersection of Interstate Route 81 and Interstate Route 581 north of Roanoke, Virginia, then southeasterly over I-581 to the intersection of U.S. Route 220 at the Virginia State Line, then southerly over U.S. Route 220 to the intersection of State Route 68 northwest of Greensboro, then southerly over U.S. Route 68 (sic) to the intersection of Interstate Route 40 north of High Point, then southeasterly over I-40 to the intersection of U.S. Route 220 in Greensboro, then southerly over U.S. Route 220 to the intersection of U.S. Route 1 in Rockingham, then southwesterly over U.S. Route 1 to the intersection of State Route 9 near Cheraw, South Carolina, then southerly over S.R. 9/38 to the intersection of U.S. Route 501 near Marion, then southerly over U.S. Rout(e) 501 (sic) to the intersection of U.S. Route 701 in Conway, then southwesterly over U.S. Route 701 to the intersection of U.S. Route 17 in Georgetown, then southerly over U.S. Route 17 to the terminal interchange of Interstate Route 26 in Charleston, South Carolina.” The southern terminus of this route, along with certain other segments, would be modified in the ensuing years. An Interstate 73-74 Future Corridor sign is posted on southbound U.S. 220 after the Midway Road off-ramp in Rockingham, North Carolina. Photo taken 05/30/07. Bob Malme covers both Interstates 73 and 74 extensively through his web site. Find construction information, a time table for when the next segments will open, exit lists, and more. Interstate 73 appeared first on the 1997-98 North Carolina Official Highway Map. 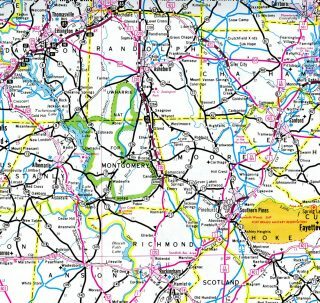 When first signed, Interstates 73 &amp; 74 ran just 31.5 miles from U.S. 220 south of Candor to the exchange with U.S. 64 in Asheboro. The freeway was extended south to Ellerbe by 2008. In South Carolina, Interstate 73 will begin at U.S. 17 in Myrtle Beach, using South Carolina 22, the Conway Bypass / Veterans Highway. Interstate 74 will go northeast via the Carolina Bays Parkway (South Carolina 31) and North Carolina 211 to Whiteville, North Carolina. Interstate 73 will turn northwest via U.S. 501 and U.S. 1 to the North Carolina State Line. Interstate 73 would meet a proposed eastern extension of Interstate 20 near Marion, South Carolina. Interstates 73/74 were originally slated to begin in Charleston under the 1991 legislation, but it was moved back to Myrtle Beach as a result of 1995 and 1998 actions. These actions were the result of Governor Mark Sanford, then 1st District U.S. representative. Gov. Sanford heeded the objections of residents in both Charleston and Georgetown Counties relating to historical and ecological impacts that may incur with the construction of Interstate 73. These legislative actions were reconsidered in 2004, but unchanged, reaffirming that Interstate 73 will not continue south of Myrtle Beach. No southern extension to the Interstate 73 high priority corridor was included in the 2005 Safe, Accountable, Flexible, Efficient Transportation Equity Act – A Legacy for Users (SAFETEA-LU); however, a significant sum of money was appropriated in that bill to Interstate 73 north of Myrtle Beach in South Carolina. The South Carolina 22 (Veterans Highway) freeway fully opened to traffic on May 4, 2001 after 15 years from planning to completion. Constructed over the course of three years, the $368-million highway was completed six months ahead of schedule.7 The southerly portion of Veterans Highway, between S.C. 90 and U.S. 17, opened on June 29, 2000. It includes the Intracoastal Waterway Bridge, which saw initial work in 1994.8 Following that portion was the completion between South Carolina 90 and 905, including the crossing over the Waccamaw River on November 6, 2000.9 The 28-mile roadway provides an easterly bypass of Conway from U.S. 501 to U.S. 17 west of Windy Hill Beach. Interstate 73 in North Carolina will parallel NC 38 from the state line and merge with Interstate 74 to the south of Rockingham and Hamlet. U.S. 74 bypasses the two cities along a freeway, which I-73 & 74 will take west to a new alignment, the Richmond Bypass. The Richmond Bypass is a new terrain alignment planned from U.S. 74 northeast to U.S. 220 south of Ellerbe. North from Rockingham, Interstate 73 supplants U.S. 220 from Ellerbe to Greensboro. I-74 overlaps with I-73 north to Randleman, where it turns west to High Point. Interstates 73 and 74 were designated by AASHTO in 1996. The route was initially applied to the 1996-opened freeway between Seagrove and Ulah, and the preexisting U.S. 220 freeway to U.S. 64 at Asheboro. $700 million in transportation bonds released by Gov. Mike Easley were allocated for Randolph County, North Carolina. Of these funds, three projects were under consideration involving the Interstate 73 & 74 corridors. The first of which entailed safety improvements and the upgrading of U.S. 220 to Interstate standards from the Asheboro city limits northward to the Greensboro urban loop. This eight mile segment was scheduled for construction between 2007-08. A second major project involved the construction of an 11.5 mile freeway between U.S. 220 and the city of Archdale. This included the U.S. 311 connector to Interstate 73 and joins the area with Piedmont Triad International Airport (PTI). Work on this project was also scheduled for 2007-08. A third project was the upgrade of the Interstates 73/74 rest area at Seagrove to a full tourist information center. Construction on the 20 acre site was slated for 2006.2 In 2005, funds were appropriated to several sections of Interstate 73 in North Carolina as part of SAFETEA-LU. Interstate 73 was eventually completed south from Candor south to Ellerbe in 2008, as was the southwest quadrant of the Greensboro beltway (Painter Boulevard). The new alignment for I-74 from Randleman (I-73 & U.S. 220) northwest to Archdale opened to traffic in stages between November 2010 and June 2013. Upon completion, I-73 was made official northward from Randleman to Greensboro. In West Virginia, Interstate 73 was planned to enter from the east, following the corridor connecting Blacksburg, Christiansburg, and Roanoke in Virginia with U.S. 52 in Bluefield. The Interstate 73/74 route through West Virginia was split into three segments: Huntington area, Huntington to Williamson (Tolsia Highway), and Williamson to Bluefield (King Coal Expressway). At Bluefield, Interstate 73 was to pick up Interstate 74 and U.S. 52 from the south. The pair would merge in a northwesterly direction along an upgraded U.S. 52 corridor all the way to Huntington, where they would cross into Ohio. A significant sum of money was appropriated toward the construction of the Tolsia and King Coal Highways in the 2005 SAFETEA-LU transportation reauthorization bill. However, the corridor was not envisioned as an interstate grade route, and instead to expressway standards with at-grade intersections. The Interstate 73 Corridor is probably the least likely to be constructed in Ohio, despite the federal law designating the route. As proposed in the 1995 National Highway System Act, Interstate 73 would enter Ohio via the U.S. 52 corridor. It would join with Interstate 74 between Huntington, West Virginia and a point near Lucasville, Ohio. Interstate 73 would then supercede U.S. 23 and follow it north to Portsmouth and Columbus, including the Portsmouth bypass project. Within Columbus, Interstate 73 might have followed Interstate 71 and Ohio 315, but those plans were not clear. The proposed route in Delaware County would follow U.S. 23 south from Waldo, then skirt the northeast edge of Delaware to U.S. 36, following that route toward Interstate 71. Then it would head northwest via U.S. 23 from Columbus toward Toledo via Marion and Ottawa. Interstate 73 would likely loop around Toledo via Interstate 475 or via Interstate 280. The route would leave Ohio via the U.S. 23 and U.S. 223 freeway or via U.S. 127. In Michigan, Interstate 73 was proposed to follow U.S. 223 northwest from Toledo to Adrian, then turn north along U.S. 127 through Lansing to Interstate 75. Interstate 73 would then run tandem with I-75 from Grayling north to Sault Ste. Marie, but it was unclear if it would be cosigned all the way to Canada. Most of this corridor was already freeway, except for U.S. 223. Between 1999 and 2001, the Michigan Department of Transportation studied the feasibility of the Interstate 73 Corridor in that state. The study was completed in December 2001, with a decision not to proceed with Interstate 73 due to lack of funding and a lack of need along certain portions of the route. As part of this study, various corridors were considered, including an option to route the freeway through Toledo or to send it south on U.S. 127 to the Ohio Turnpike rather than using U.S. 223. On April 16, 1999, AASHTO’s Route Numbering Subcommittee approved the elimination of U.S. 27 north of Lansing and the designation of U.S. 127 over the same route. By 2001, signs for U.S. 127 appeared on the route. Another reason why Interstate 73 was deferred in Michigan was because the State of Ohio also stopped its feasibility study for Interstate 73. This left the freeway in doubt for both Michigan and Ohio. Furthermore no appropriations for this portion of the corridor were made in the 2005 SAFETEA-LU transportation reauthorization bill. Interstate 73 extends north from Joseph M. Bryan Boulevard, an east-west freeway joining Greensboro and I-840 with Central North Carolina International Airport (PTI), along the U.S. 220 / NC 68 Connector to U.S. 220 at the Haw River. Four miles south of Candor, an end Interstate 73 and 74 shield assembly previously posted near the former south end of the U.S. 220 freeway. Photo taken by Chris Patriarca (08/16/03). U.S. 220 returned to its former alignment (U.S. 220 Alternate). The Alternate route follows the original U.S. 220 through Candor, Biscoe, Star, Ether and Seagrove. Photo taken by Chris Patriarca (08/16/03). Two-way traffic commenced for U.S. 220 southbound. This portion was bypassed in January 2008, when I-73 & 74 were extended south beyond Ellerbe. Photo taken by Chris Patriarca (08/16/03). “Activists vow fight if I-73 plans move farther south.” The Sun News (Myrtle Beach), July 19, 2003. “Citizens prioritize for NCDOT.” The Courier-Tribune, October 14, 2003. “Interstate corridor might go through Marion County.” Florence Morning News, October 2, 2003. “I-73 proposed as toll road.” John Lansford, post to MTR, December 16, 2003. “Re: S.C.: Interstate 73 backers look to other states.” Sherman Cahal, post to MTR, Wednesday, April 13, 2005. “Short Road Has Wide Influence.” Sun News (Myrtle Beach, SC), May 4, 2001. “Veterans Highway Offers Some Relief (Conway Bypass Opens).” Sun News (Myrtle Beach, SC), June 30, 2000. “Part Of S.C. 22 Opening Monday.” Sun News (Myrtle Beach, SC), November 3, 2000. “New I-73 signs go up, but not the highway.” The Roanoke Times (VA), April 3, 2015. 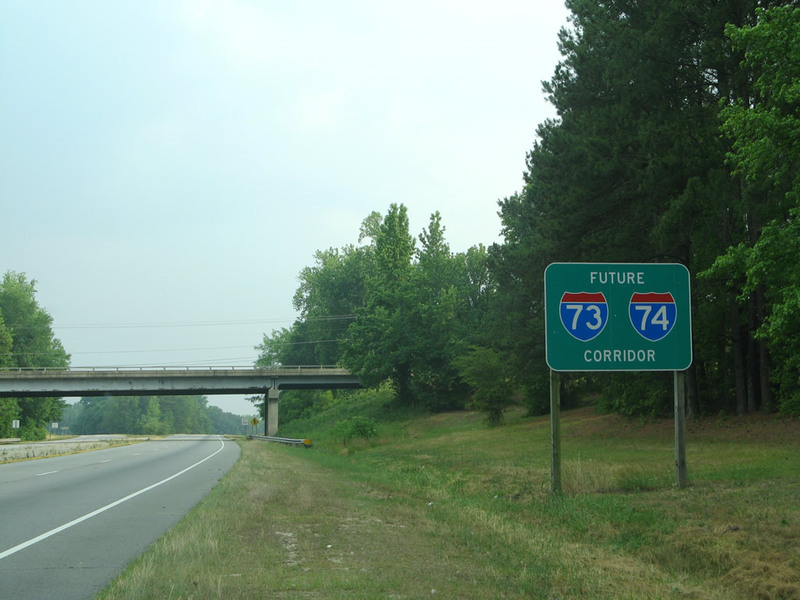 “New leg of I-73 in Triad to open this year.” Triad Business Journal, January 26, 2016. “Re: Interstate 73/74” online posting by bob7374, AARoads Forum, February 26, 2016. “I-73 project closer than it’s ever been to construction.” WMBF, May 25, 2016. “County supervisors told I-73 project appears to be over.” Martinsville Bulleton, May 24, 2016. “Re: I-73 in VA” online posting by Grzrd, AARoads Forum, May 26, 2016. “Governor Cooper Celebrates New Section of Interstate 73.” North Carolina Department of Transportation (NCDOT), news release. June 9, 2017. “Bryan Boulevard reopens following construction.” WGHP (High Point, NC), July 3, 2017. “Four New Projects for Division 8 in Updated Draft Transportation Plan.” North Carolina Department of Transportation (NCDOT), news release. June 29, 2017.